I came up with this recipe for the “mix it up” contest at the fair. You could either use a mix for something it wasn’t intended for or make a cake with a mix and put a twist on it. I went for the former and used a cake mix for the base of these indulgent treats. Although they didn’t place, the judges wrote “Very good–wonderful flavor!” in the notes on my eval sheet and everyone I’ve served them to agrees. My favorite thing about them is that you can whip them up and have them in the oven in less than 10 minutes. Perfect for us busy people! Preheat oven to 350 degrees and grease the bottom and sides of a 9×13 pan. In a large bowl, combine the cake mix, egg & butter. Beat on medium speed until well mixed. Shape the dough into a ball and, using your hands, press it out into the bottom of the prepared pan until it is in an even layer & reaches the edges. Spread the dulce de leche over the cake mix layer, all the way to the edges. Sprinkle the remaining ingredients over the top, layering half of each and then repeating, and bake for 35 minutes. Remove from oven and give it a few hard taps against a heat resistant surface to settle any puffiness. Allow to cool completely on a wire rack before cutting. 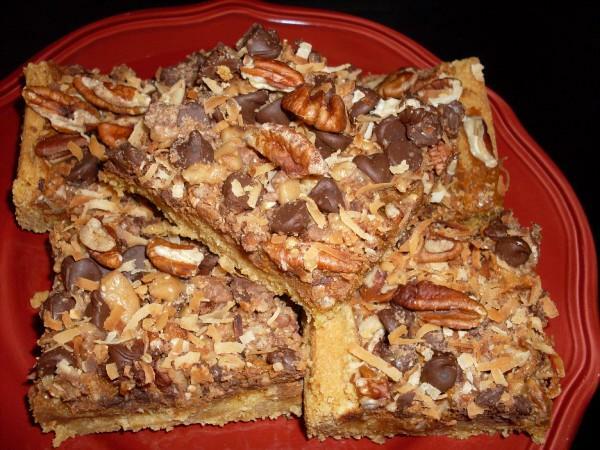 Posted in Brownies & Bars and tagged bars, chocolate chipes, coconut, dulce de leche, pecans, toffee. Bookmark the permalink.